NEW VIDEO!!! this is seriously The most delicious crisp of ALL time and perfect for fall dessert or Thanksgiving! I also get it that even though I am struggling to believe that we are the better part of the way through October, Thanksgiving is just around the corner, and I am already starting to brainstorm about a menu since we are going to be having a ton of people this year. And dessert is SUCH an important part of that- and there is no doubt that this crisp is happening. I always think of the crisp as the lazy man’s (or woman’s) pie. There is no fuss with a crust, and part of the charm of the crisp is how “rustic” it is- especially when baked in a skillet. You know what else it is? Besides lazy and rustic and easy? Freaking delicious. Peel and thinly slice the Granny Smith Apples. Put a 10” cast iron skillet or oven proof pan on the oven over medium heat. Add the sugar, salt and cinnamon along with the coconut oil and coconut cream to the pan. Stir to combine and let sit until the sugar begins to turn golden and liquid. Stir until really smooth, then turn the heat off. Add the Apples directly to the hot caramel. In a separate bowl, combine the gluten free oats, gluten free flour, brown sugar, salt, nutmeg and coconut oil. Combine the toping with a pastry cutter until well combined and crumbly. Add it to the top of the apples. Transfer the skillet to a sheet pan and put the whole thing in the oven. 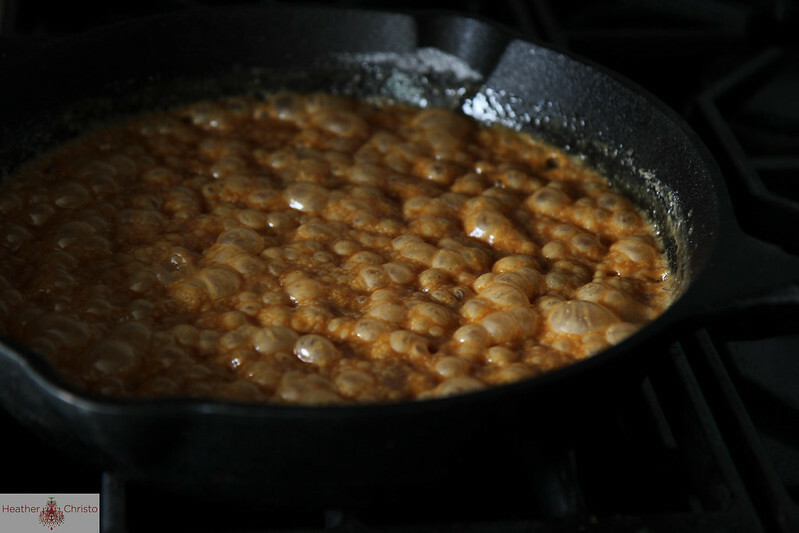 Bake for 45-60 minutes until the caramel is bubbling and the apples are soft. 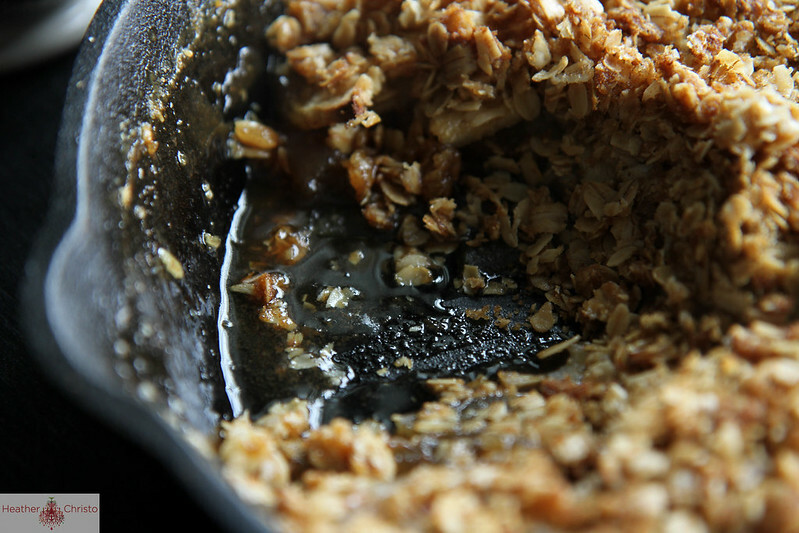 In a separate bowl, combine the oats, flour, brown sugar, salt, nutmeg and coconut oil. Combine the toping with a pastry cutter until well combined and crumbly. Add it to the top of the apples. Transfer the skillet to a sheet pan and put the whole thing in the oven. Bake for 45 minutes until the apples are soft, the caramel is bubbling and the apples are soft. WOW – this looks amazing! I can’t wait to try it. I love baked apples – and this crisp, mmm. This is my kind of dessert! Oh my gosh, Heather this is heavenly! Such a perfect fall dessert! Love these simple seasonal desserts. I can see why you ate the whole pan! Oh man!! Hope that little stinker will start sleeping through the night!!! 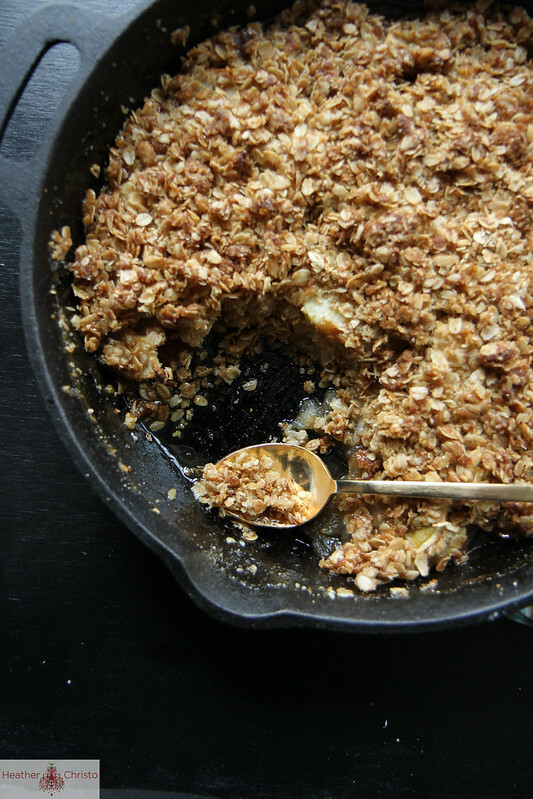 And thank you for sharing this beautiful dessert… I just got a skillet and want to make this now!! Thank you Amanda- it is like having a new baby! He slep 7 hours last night and I felt like a new woman this morninG! Wow, this dessert looks so delicious! 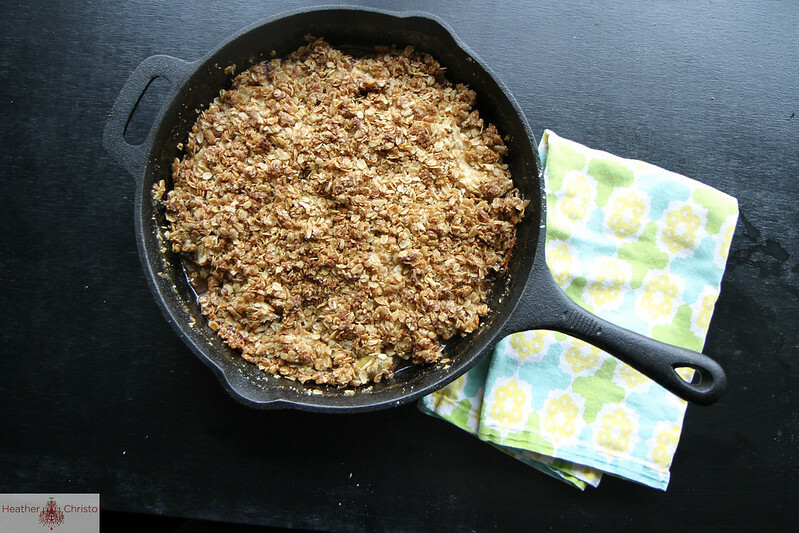 I love the flavors and apple crisp is one of my favorite desserts!! Holy cow! This crisp looks awesome!!! The best puppy book I ever read was “I Just Got a Puppy, What Do I Do?” by Mordecai Siegal and Matthew Margolis. It was a life saver. Oh my goodness! I want this for breakfast! …totally not kidding. 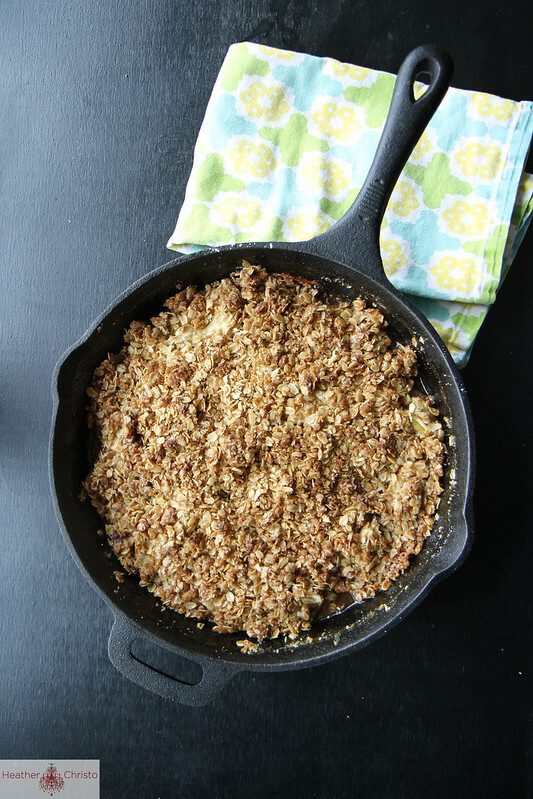 Any time I can use my skillet for something yummy, I’m in. Looks delish. 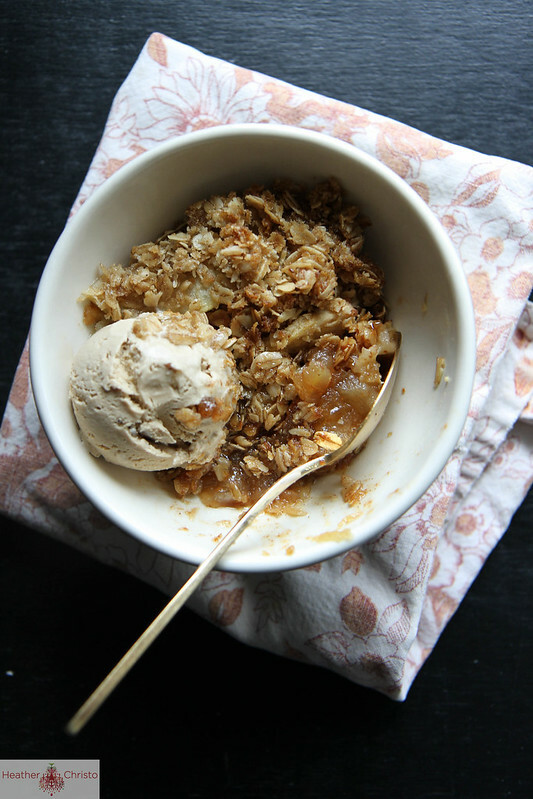 Love this crisp for cozy winter desserts! So perfect for fall! And I love the flavor combination. You had me at salted cinnamon caramel! Apples and caramel were meant for each other! Ooh, such a great idea! I must have missed something? What/who should sleep through the night? Did you get a new puppy? What happened to your other dog? Hi Jay! I wonder if you somehow got an old post sent to you from when we had a puppy?! weird tech glitch! What a lovely fall dessert you’ve brought us. I’m thinking a bowl of your apple crisp would be perfect while setting by a fire, sipping on a mug of coffee as the leaves fall. Yes please!! Sounds great Ron! Is it possible to make this the day before? If so, how would you re-heat it? Thanks!! Can’t wait to make it, it looks SO GOOD!!! 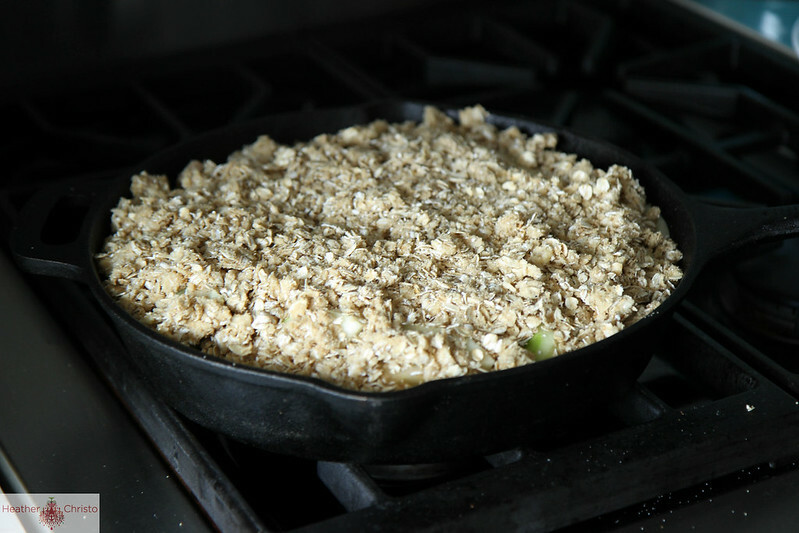 Pingback: Cinnamon Caramel Apple Crisp – Vegan and Gluten Free Recipe Video – GetCooking! Brought this to a birthday party today and it was a hit! Much less sweet than apple crisps I’ve had/made before. 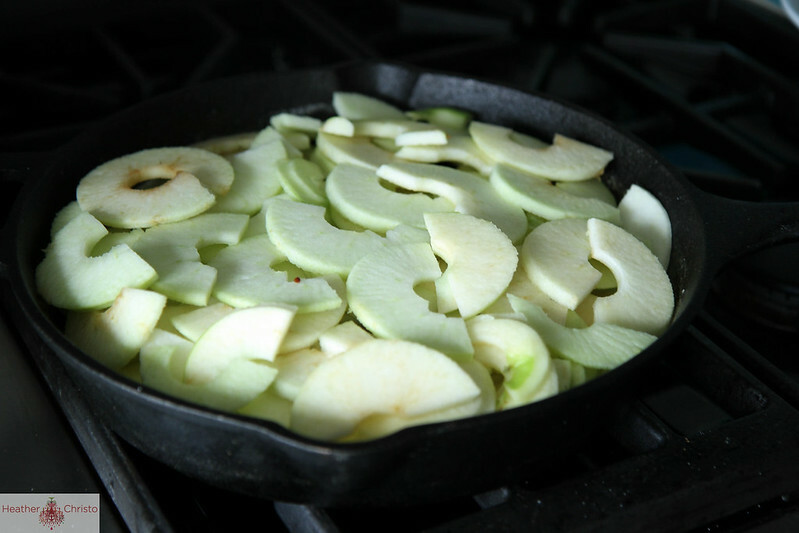 Is this crisp reason enough to justify buying a 10″ skillet? Mine is larger (11 3/4″?) and some of the apples in the center weren’t quite cooked enough. Oh, and no one knew it was vegan and GF! Just bake a little longer and use what you have- no problem! So glad it was a hit!